Say Cheese!! 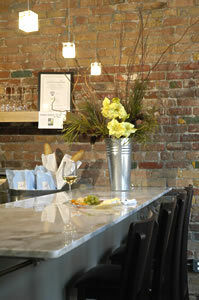 Then picture yourself surrounded by over 100 varieties of specialty artisan cheese! Saunders Cheese Market is Spokane's purveyor of these fine offerings. If you are a gourmet food aficionado or just a person who loves quality cheese, this quaint little shop is a Spokane must-see or even better, a must-taste! The rich earthy aroma of cheese greets you at the door and the deli case literally glows yellow with its tasty delights. Located in an old market space the shop makes you feel like you’ve stepped into the local cheese shop of a small European village. The cheeses are so fresh you would swear there are cows and cheese making happening in the back alley! The artisan cheeses are wrapped in paper to preserve their taste and flavor and kept at the perfect temperature and humidity. From fine Brie and buttery triple creams to farmhouse style aged Gouda and sharp artisan chedders, there is a plethora of good taste to choose from. 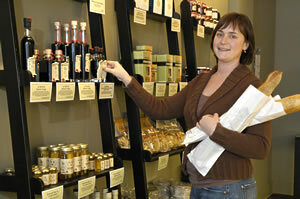 The staff is very knowledgeable and eager to offer samples and suggestions. A small table area and marble dinning counter are available for in-house cheese plates accompanied by a glass of wine and friendly conversation. 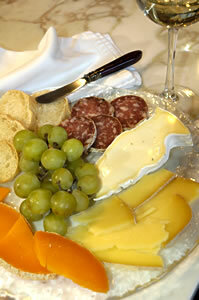 Fine handcrafted cheeses, especially those from the northwest, are rapidly becoming a favorite with gourmet food lovers. 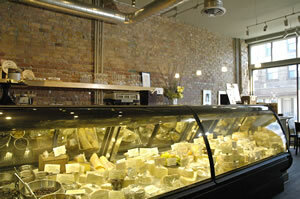 Let Saunders Cheese Market help you indulge your taste for fine cheese.